For the first time in my long-distance running experience, I thought the race would be cancelled. The weather forecast ranged from a 70-90 percent chance of thunderstorms every hour for ten hours straight. There was no way around it. The race would go on rain or shine, but thunder and lightning would close it down. By the time I went to bed Saturday night, I was certain that I’d show up to the start line already drenched, maybe get a chance to start the race, only to have us pulled off the course for safety. When I woke at 6:30, the sky was light gray, evidence that the storm hadn’t arrived yet. If it could only hold off a few hours, I thought. I readied myself and drove to the event with a few sprinkles on the windshield. Just hold off, I continued to pray. Just wait. We started promptly at 7:30 a.m. The air was so damp that the humidity had to be 100 percent, but with the temperature at only 70 degrees, it wasn’t bothersome. As each mile passed, I counted the mileage that remained and felt grateful that the storms hadn’t arrived. By mile six, a light drizzle began. No problem, I thought. I’m almost half way done. By mile eight, the drizzle turned into a gentle rain. Still, no thunder, no lightning. At mile ten, the rain got and stayed heavier, but with only three miles to go, I didn’t care. I was going to finish no matter what. 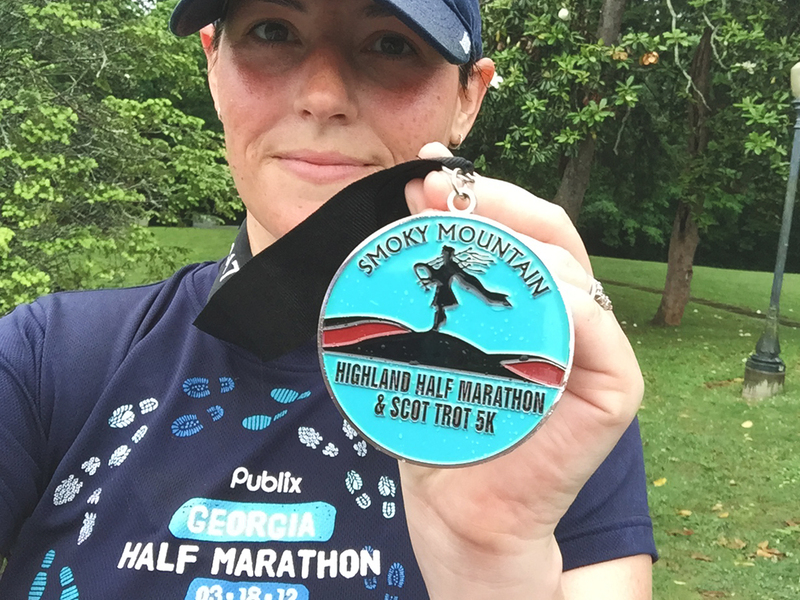 There were steep hills and a steady rain, and I’d only accomplished ONE long run (10 miles) while training, but I crossed the finish line in 2:22, in keeping with my usual pace (give or take). Once again, muscle memory and mental strength endured. I spent the rest of Sunday in bed watching Masterpiece Theater episodes (Victoria) that had collected on my DVR. 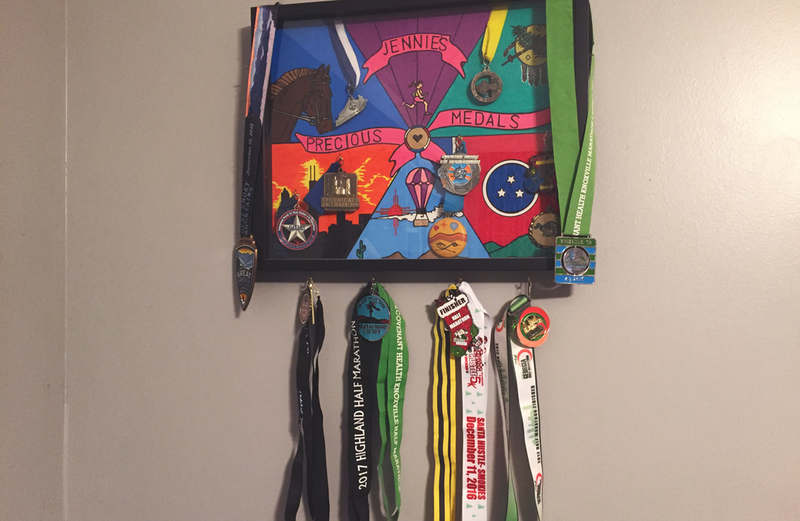 Occasionally, as I enjoyed pizza and homemade cookies, I’d glance over at my medal collection and feel grateful that I started running ten years ago. I am not stick-thin, and depending on the day, one might be surprised that I’m a runner at all. But I don’t run for anyone else. I run for me, for those medals, to combat the dysmorphia and to clear my head and to bring balance to my life. Since summer in the South is unbearable, I’ll stick to the treadmill and lifting at the gym during the hottest months. Now I’m on the lookout for a couple of fall and winter races so I can keep adding to the collection. I’ve said it before, and I’ll say it again, one day I will not be able to do this. Today is not that day.